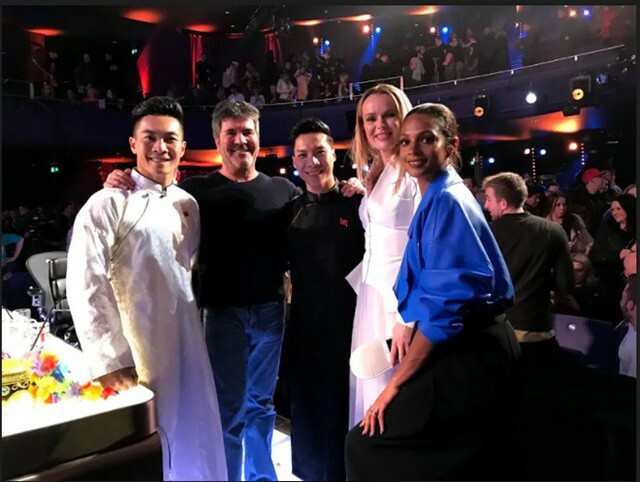 The Giang brothers circus acrobats are considering withdrawing from the Britain's Got Talent TV show to prepare instead for a live show in Vietnam. In an interview with Dantri/Dtinews after their impressive TV performance, the younger brother, Giang Quoc Nghiep, said they were very happy at the response from Vietnam and many other countries after the show. The 29-year-old circus artist said that they were reluctant when invited to participate in the Britain's Got Talent TV show because they knew the show often priortised dance and music acts rather than circus performances. "Another reason we weren’t eager was that we achieved a Guinness World Record, so a TV show seemed a too small stage for us," Nghiep explained. "We also refused to participate in the American’s Got Talent before." However, the brothers were encouraged and supported by many artist friends including designer Nguyen Cong Tri, choreographer Tan Loc and music composer Tran Manh Tuan to take part in the show to introduce Vietnamese circus to an international audience. "Based on this encouragement, we flew to Britian," Nghiep continued. "We didn't have much time to prepare and we didn't set a target to win the competition. But we showed our acts and introduced about Vietnamese circus to international friends." Nghiep said that the judges had suggested they arrange a performance for the British Royal Family but they haven't accepted due to their busy schedule in Vietnam at present. "We’re also thinking of pulling out of Britain's Got Talent as our purpose for joining this show was to introduce Vietnamese circus to more people but not to win that show. We want to focus on our live show which will be organised this June in Vietnam.